1 & 6: Lately I've been looking to update my very limited clutch collection, and while frequenting the usual online stores these bags recently caught my eye. I'm particularly obsessed with this dupe of the Vlieger & Vandam 'Guardian Angel' gun embossed clutch on the right, and at only a mere fraction of the original price I may have to get my hands on it. 2: Another dupe I've been loving lately is this copy of Zara's eye print dress, which you may recognise considering it's currently a favourite amongst fellow bloggers. It's a bit of a love or hate item, as proven by the controversy that ensued when Lena Dunham posted a photo of it on Instagram, but I happen to adore it. 3: When perusing SheInside I spotted this beauty of a bralet. My recent purchases all seem to revolve around the minimal aesthetic, so I think this piece would be the perfect addition to my summer wardrobe. 4: I've been lusting after an oversized striped tee for the longest time now, and the fit of this specific one looks ideal for what I had in mind. In my opinion it's a universal basic that everyone should own, as it's one of those items that you can lazily throw on with a bit of jewellery and a red lip yet still manage to look put together. 5: A girl can never have too many pairs of denim shorts, right? 7: As I recently mentioned on my blog I'm currently addicted to basic slogan tees (the wittier the better). This is another blogger's favourite at the moment, and I think it's another one of those effortless pieces that you can manipulate to look as though you put in much more effort than you actually did. 8: I've been eyeing up these shorts for several months now, and since it's getting closer to the summer I thought they'd be perfect for my upcoming road trip around California. It looks as though I'll finally have to add them to my online basket! Nice picks! I've got to say, both these bags are amazing! WOw, I love your style! New follower here! Oh god I am dying for that zara eye dress, it's just so gorgeous! I know it's not on this post but I have serious hair envy, what fab hair you have!!! #3 looks soo cute! 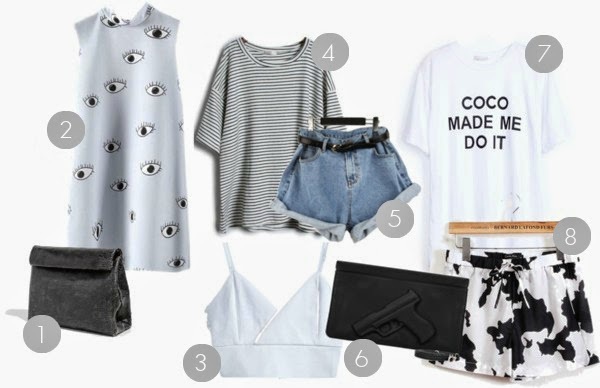 I bought the #5 from sheinside and was so disappointed because the shorts looked nothing like the picture! such a bummer!